Citation: C N Trueman "Newspapers in Nazi Germany"
Control of newspapers was put into the hands of Joseph Goebbels, the head of the Ministry of Popular Enlightenment and Propaganda. Goebbels set up a department within the ministry that dealt solely with newspapers. The newspapers had to spread the same message as everything else – Gleischaltung – the coordination of the whole of Nazi German society so that it acted and thought the same. Therefore people could only read the news as it was presented to them by the government. On October 4th 1933 the Reich Press Law stated that all journalism had to be “racially clean”. Any Jewish and liberal editors and journalists were sacked and all remaining editors had to take a Nazi citizenship test and prove that they were not married to a Jew. Any Jew who owned a newspaper was pressurised into selling out. If any Jewish owner refused to do this, the government banned the production of his newspaper for a few days that could then become weeks and months. By using this tactic, the Nazis hoped to bankrupt Jewish newspaper owners. This is what happened to the Jewish owned publishing house Ullstein. It was taken to the brink of bankruptcy and sold out to Eher Verlag, the Nazi publishing house based in Munich. One of the newspapers acquired by Eher Verlag was ‘Vossische Zeitung’, a celebrated liberal newspaper founded in 1703. To prove to the world that the Nazi government was reasonable, Goebbels allowed the highly respected ‘Frankfurter Zeitung’ a degree of independence from central interference on the understanding that it got rid of its Jewish owners. Nazi newspapers predictably did well after January 1933. The official newspaper of the Third Reich was the ‘Vőlkischer Beobachter’, which was edited by Alfred Rosenberg who was considered to be the Nazi Party’s primary intellectual. Joseph Goebbels had his own newspaper, ‘Der Angriff’. The ‘Vőlkischer Beobachter’ was printed in Munich and appeared in the morning while ‘Der Angriff’ was printed in Berlin and appeared in the afternoon. In this way, the Nazis covered the whole of Germany. Both newspapers fawningly supported Hitler and National Socialism and pushed Nazi ideas. To ensure that all major newspapers were in Nazi hands, Goebbels gave the old Berlin newspaper, ‘Boersen Zeitung’ (Stock Exchange Journal) to Walter Funk, Hitler’s economic and financial advisor. ‘Vőlkischer Beobachter’ translated as ‘Racial Observer’. It was the main Nazi daily newspaper and it was used to peddle whatever Goebbels wanted. It was anti-Semite, anti-Communist, anti-liberal and completely fawning towards Hitler. During World War Two, the German public only read about the ‘good news’ as nothing bad was allowed to be reported. ‘Der Angriff’ translated as ‘The Assault’ and it was a newspaper founded by Goebbels in 1927 and became effectively his property. Its subtitle was ‘For the Oppressed against the Oppressors’. The right hand column of the front page was reserved for the personal comments of Goebbels that were signed off ‘Dr G’. There were many libel actions against ‘Der Angriff’ but none were successful. It never had the circulation of ‘Vőlkischer Beobachter’ and became simply a tool to voice the opinions of Goebbels. Some individual Nazis were allowed to produce their own newspapers as the party hierarchy had no doubts that they would not peddle the party line. Probably the most infamous was ‘Der Stűrmer’ by the anti-Semite Julius Streicher who claimed that ‘Der Stűrmer’ was Hitler’s favourite read. However, Goebbels viewed the newspaper as little more than a ‘daily rag’ and believed that it was more likely to harm the regime than present it in its best light such was the paucity of its contents that occasionally bordered on the pornographic. 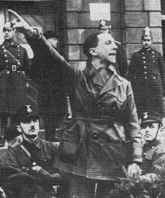 However, it is said that Hitler read each issue from cover to cover and any protests that Goebbels might have made would have fallen on deaf ears. Towards the end of World War Two, Goebbels had the opportunity to ban ‘Der Stűrmer’ using the lack of paper as a reason. At its peak, Goebbels supervised more than 3,600 newspapers and hundreds of magazines. He met the editors of the Berlin newspapers each morning and told them what could be printed and what could not. He kept in similar contact with editors based elsewhere in Germany using telegrams. It is almost certain that every editor knew what was in store if he broke away from the instructions set by Goebbels. All editors were expected to fully praise Hitler and senior Nazi officials. In 1937, Goebbels appointed Hans Fritzsche as his link with Germany’s newspaper editors. However, it does appear that the German public became tired of the lack of choice when it came to newspapers and the constant hammering home of National Socialist ideals. The annual sales of ‘Vőlkischer Beobachter’ fell drastically between 1933 and 1939.